Kerala, known as God's own Country is blessed with gifted personalities who have made their land proud through their active presence and innovative approach to life. Born with brain and beauty, Gayathri Suresh who hails from Thrissur has already made her name in the history of Miss Kerala Competition by winning the 2014 title. Here is a unique chance to know more about Gayathri Suresh who is ready to explore the grand opportunity and responsibilities. Gayathri Suresh was born in 1992 at Thrissur as the daughter of Suresh Kumar and Rekha. During her early education, Gayathri did participate in various competitions conducted in her school. She was interested in dancing and other stage programmes which gave confidence to walk up the ladder of achieving her dream to become successful in life. Coming from a normal orthodox family, Gayathri was well supported by her parents who gave motivation to strive high in studies and extracurricular activities. After her higher education, Gayathri joined the college with aim to get a job and create her own space in the living world. Gayathri gave predominant importance to dancing and dedicated herself for a year in learning classical dance. Even though not a professional singer, she sung at the club functions. The college life gave Gayathri new experience to mingle with friends having innovative thoughts and positive attitude towards life. She was recruited as an employ to the South India Bank through a campus interview. Working at the banking sector, Gayathri nurtured her dreams to do post graduation and Master in Business Administration. Interested in modeling and acting, young Gayathri applied for the Miss Kerala 2014 contest. 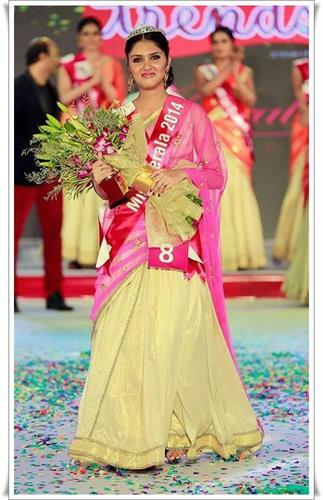 From the 300 entries, Gayathri was invited to be a part of the grand finale which had 22 contestants in the list. Launched in 1999 by Impressario Event Management Company, the 15th edition of Miss Kerala was a unique opportunity for the young beauty to show her real power with physique and brain. Truly aware about the aim of the contest, Gayathri wished to be the Kerala beauty which could symbolize the true values of a Keralite, who could symbolize the true values of a Keralite, its land, its vast prosperity and cultural heritage. Miss Kerala 2014, the grand beauty contest gave a rare opportunity for Gayathri Suresh to show her brilliance on the stage. Gayathri became too friendly with her co – participants like Konjitha John, Janitha Thomas, Lavanya, Sharon Varghese, Priyanka Menon and Sukanya Sudhakaran. The rigorous seven-day grooming session lead by professionals which was held prior to the contest totally changed her attitude transferring a large amount of confidence and will power. The mentors were instrumental in changing and shaping her personality. Held the Camelot Convention Centre at the Venice of the East, Alleppey, the Miss Kerala contest was truly a visual treat for the viewers who were present at the occasion. 22 year old Gayathri who stepped on to the stage with limited prior stage experience dominated different segments of the beauty competition gave her best performance walking through the ramp. The final question posed to her by the judges was, "What does a man see in a woman at first sight?". With immense self confidence, Gayathri answered, "The response differs according to different men and their attitude. Some men see the personality of the girl while some see her physicality." Her bold reply too impressed the judges which gave an edge in the final selection of beauty with brain. When final declaration of the title winner was announced, Gayathri could seldom keep her excitement and walked through the ramp with perfection. Konjitha John and Janitha Thomas were declared the first and second runner up respectively. Much interestingly, the first three winners will also given offers including attending an audition for the commercial with Amithabh Bachanan. As the Miss Kerala platform is set to be a gateway to the world of glamour, Gayathri who got some modeling assignments and film offers has left the thought to her parents. Being much determined to become a successful entrepreneur, Gayathri keeps the Seematti Managing Director Beena Kannan as her role model. Currently undergoing preparation for the Common Attitude Test (CAT), Gayathri is too ambitious to make her own space in the living world.